Uile, uile ko palama. That is how Nepali fairy tales start, opening up a vista of magic and mystery in the imagination of children. Despite the changes wrought by time and circumstance, the tradition of story-telling remains. This is one such story. 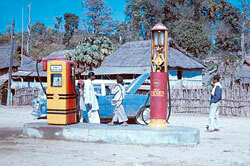 I had long nurtured the dream of travelling overland from the oldest democracy in the world to the largest. 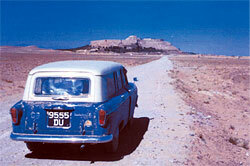 The opportunity to travel from Britain to India along ancient trade routes came in 1962 and I set off in a reliable old Vanguard Estate car 9555DU. 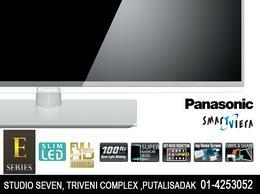 The registration number being divisible by seven was considered lucky. The war had long since ended and as the curtain came down on the British Empire there was an urgent need to keep alive the comradeship that came off the battlefields and channel it towards the spirit of adventure. We all have our dreams and mine was 'to restore old friendships eroded by time and neglect' using the Commonwealth as the ideal starting point. And although Nepal is not a member of the Commonwealth-although in my view it should be-a journey to India would have been unthinkable without first calling on Nepal where so many of my old friends lived. By the time I got to Bazagan on the Iranian side of the Turkey-Iran border within sight of Mt Ararat, I was half way there. This was where the United Nations Asian Highway began, following the line of the old Silk Route between Venice and Hanchow. Alexander the Great had come this way in the 4th century and Marco Polo in the 13th. And there was room for me in the 20th! I often slept under a canopy of stars in the deserts of Iran, Syria, Iraq and Afghanistan and never dreamt that I might be harmed in any way or have my possessions stolen. It would not be quite that way today, such is progress. What made me persevere was not only the prospect of meeting many of my old friends in Nepal but also the inspiration I would imbibe from them to carry me on to my journey's end. 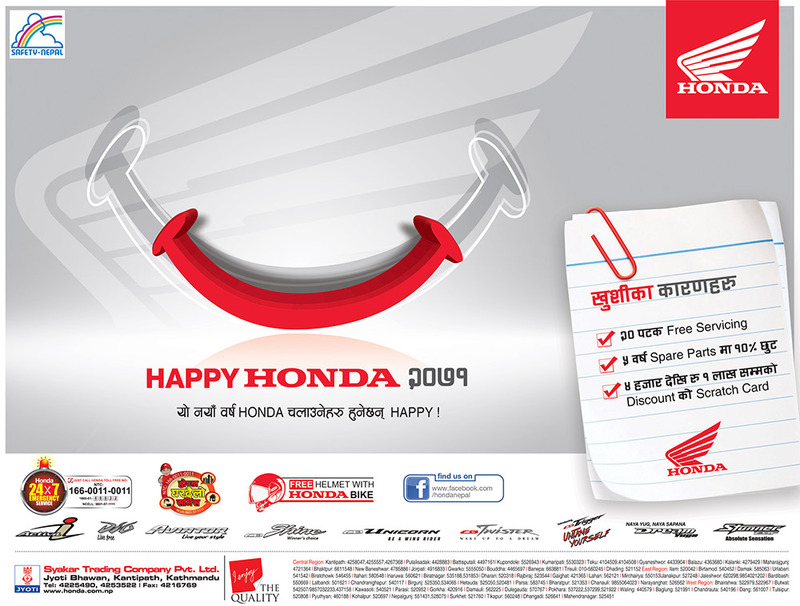 These were the thoughts that encouraged me to compose a little verse that would lend itself to juwari treatment when the madals began to play in Pokhara. 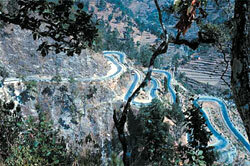 9555DU entered Nepal at Raxaul, continued along the single lane asphalt road across the Char Kose Jhari, stopping at Amlekhganj for petrol, then on to Hetauda and up the serpentine hairpin bends of the newly completed Tribhuban Highway. In Nepal, I was to meet many of the Gurkhas I had known and served with in the army, among them my orderly Purnaram Gurung. We sang some of the old songs together and they were surprised I could still remember the words and the melodies. Why ever not? These are just a few of the threads that bind old friends and I had travelled 6,000 miles to prove it. The thought pleased them. And if it could be done on a personal level then why not on a national level, sweeping aside bureaucratic barriers and the polemics that feed on them. 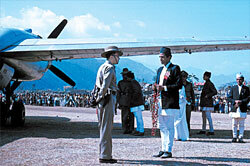 From Kathmandu I flew to Pokhara (the road hadn't been built yet) and managed to take a photograph of King Mahendra being garlanded at the airport under the wing of his plane, a Russian Illuyshin-14. I had met His Majesty when he was Crown Prince at a reception given by the British Ambassador during a visit that my brother of the 10th PMO Gurkhas and I made to Nepal in 1951. I flew back to Kathmandu, upto Sim Bhanjyang and back to the Indian plains to keep an appointment with Jawaharlal Nehru. That happy event led to the setting up of a committee to host a Commonwealth Youth Festival in order to organise a new consciousness in the Commonwealth. It was an inspired initiative. But after Nehru died, enthusiasm began to wane (a not uncommon phenomenon) and the idea of the festival was dropped. But in its place a Commonwealth Expedition, known as Comex, was launched under the patronage of HRH The Duke of Edinburgh. Made up of five contingents of 42 each, from the universities of Cambridge, Cardiff, Edinburgh, London and Oxford, Comex 1 set off from London on 31 July 1965. There were 14 expeditions in all, the largest of 500 dubbed 'the Commonwealth on wheels' by the Kabul Times as it passed through Afghanistan. They were distinguished by the symbol of a little green pennant bearing Prince Philip's cipher and the Asoka wheel in gold. Those green pennants were to become the Green Pennant Awards 'identifying the spirit of adventure with crossing the barriers that divide people' inaugurated by Prince Philip in London on 18 December 1980, endorsed at the 1995 Commonwealth Heads of Government Meeting in New Zealand and most recently presented at the Edinburgh summit of 1997. It is a matter of special significance and not only to me, that my journey to Kathmandu in 1962 should have reached its own summit in this remarkable way. 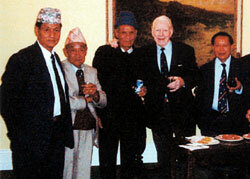 Lionel Gregory OBE is the founding Commanding Officer of the Queen's Gurkha Signals. When he sailed off to Europe in 1852, Jang Bahadur Rana became the first royalty from the subcontinent to visit Britain. He had just seized power by massacring nearly the entire Nepali nobility at the Kot. He was suspicious of the intentions of British India and was curious to see if the Angrej were as powerful as they made themselves out to be. He was taken on conducted tours of cannon factories and naval dockyards and got his hosts to organise military parades. He was suitably impressed with British military might. But it wasn't all business, Jang also savoured the delights of Bohemian London and Paris. He attended operas, lived lavishly and flamboyantly and showed a surprising adaptability in dealing with the London paparazzi of the day. Watching a ballet one evening, Queen Victoria noticed Jang swaying with the music. She was surprised and asked him if he understood the music. Jang replied through his Hindi interpreter: "Bulbul ke gan hum nahi samajte, agar achha to lagta..." Queen Victoria told everyone later she was impressed with the soldier poet. In Paris, Jang was so moved by a ballerina that he immediately took off his diamond studded gold bangle and gifted it to her on the spot. The Paris newspapers the next day couldn't get enough of it. 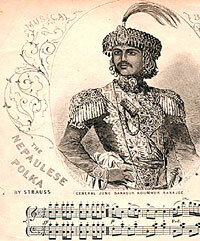 Many books have been written about Jang Bahadur's Europe visit but one fact that hadn't come to light till recently was that a member of the Johann Strauss family composed a 'Nepaulese Polka' in Jang Bahadur's honour. The British media had gone wild about the visit of the prince of Nepal and Jang's famous portrait and the score for the polka appeared as the cover story of the Illustrated London News. This would be the equivalent of Robbie Williams launching a hit single called 'Nepali Dream' on Mtv to mark the visit to London by a modern Nepali royalty. The 'Nepaulese Polka' played by Michael Kuhn is a lively and happy tune that can be downloaded on mp3 for listening from the website of German musician Johannes Bornmann.